Act 04 – Infiltrating the Party! Act 05 – Is Usagi a True Friend? Act 06 – The Transfer Student is Sailor Jupiter! Act 07 – I Was Seen Transforming! Act 11 – We Got to Meet the Real Minako! Act 12 – Sailor V’s True Identity was the Princess! Act 14: Is Usagi Turning into a Youma? Act 15: I’ll Punish the Thieves! Act 16: I’ve Got to Save Miss Osaka! Act 21: What Did You Do to Ami! Act 26: Usagi is the Real Princess! 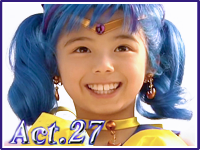 Act 27: Luna Became a Sailor Guardian! Act 28: Welcome Home, Ami! Act 29: The Transfer Student is Minako’s Rival, Mio Kuroki? Act 31: Sailor Jupiter Awakened Her Guardian Powers! Act 33: Ami is Transferring Schools? Act 35: Sailor Venus and Zoisite are Working Together? Act 36: Princess Sailor Moon Appears! Act 37: The Princess Will Bring Catastrophe!? Act 38: Believe in Me! The Planet Will Definitely Not Be Destroyed!! Act 39: Usagi’s Mama’s Challenge to Be a Reporter! Act 40: Minako VS Rei, What Will Be the Battle’s Outcome? Act 41: The Truth is, I’m a Guardian! Act 42: I Won’t Use the Power of the Illusionary Silver Crystal! Act 0: The Birth of Sailor V! The Special Act: We’re Getting Married!